Users who like Dave Messina is COO of Cofactor Genomics (CofactorGenomics.com); their multidimensional biomarker tools use RNA to enable doctors, drug developers and researchers to make far more accurate predictions on what drugs will work on individual patients. Users who reposted Dave Messina is COO of Cofactor Genomics (CofactorGenomics.com); their multidimensional biomarker tools use RNA to enable doctors, drug developers and researchers to make far more accurate predictions on what drugs will work on individual patients. 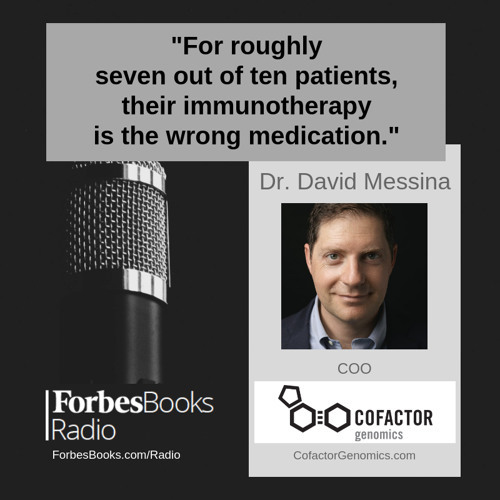 Playlists containing Dave Messina is COO of Cofactor Genomics (CofactorGenomics.com); their multidimensional biomarker tools use RNA to enable doctors, drug developers and researchers to make far more accurate predictions on what drugs will work on individual patients. More tracks like Dave Messina is COO of Cofactor Genomics (CofactorGenomics.com); their multidimensional biomarker tools use RNA to enable doctors, drug developers and researchers to make far more accurate predictions on what drugs will work on individual patients.